Our high quality 3-1/8" x 4-1/2" special size laminating pouches with long side slot help to improve the value of all printed materials. They enhance colors by turning dull prints into bright lustrous colors, help to prolong the life of printed materials and preserves them and protect them from outside elements. copy center supervisor Review by Jose R.
This is How to Use Laminating Pouches! First off, make sure your project fits inside the pouch and does not extrude past the edges. The pouch should always be bigger than your page.Next, when choosing a size, make sure your pouch laminator is big enough and can handle the pouch thickness because we sell some pretty big pouches. Pouches come in thicknesses of 3 to 10 mil, but not every size comes in every thickness. 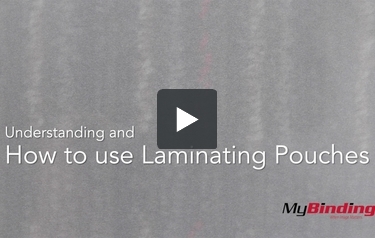 All laminating pouches have rounded corners, And you can find some with prepunch side slots. Using a lamination pouch is simple: First open your pouch and insert your project, align all the edges so they are even. Then place the pouch into the carrier so they open the same way. The edge where the two sides meet is called the crease. Line up the carrier and pouch creases. With pouch in place, slide the carrier into your pouch laminator crease end first as seen here. When it’s done, remove the carrier and unveil your beautiful new laminated project!